A Great Big Cuddle is a collection of poems for very young children, written by former UK Children’s Laureate, the award-winning Michael Rosen. Over seventy pages are filled with poems about subjects, objects and situations we can all identify with, along with silly rhymes that will simply make readers laugh. They make inventive use of language (plenty of onomatopoeia is in evidence, for starters), and some are real tongue twisters, so be prepared! There are poems that are loud, energetic and funny, and others that are melancholy. ‘Lost’, which is accompanied by an illustration of a mournful young mouse, is a heart-filled description of wondering where everyone has gone and what to do when you don’t know where they are. Chris Riddell’s illustrations are bright and extraordinarily appealing, perfectly complementing the poetry. There is a big hungry bear, a panda in a puddle, a grumpy dog, a bouncing cat, and many other adorable characters who have been inspired by the words. 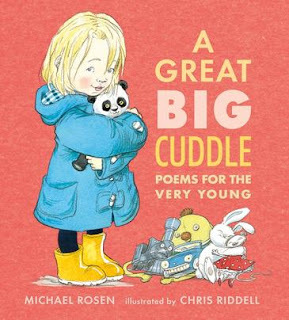 A Great Big Cuddle is a book for everyone to explore and be entertained by, and it won’t be hard to pull off the shelf and read over and over again. This is a must-read for families with young children.